19th–20th century and in the immediately ensuing years. He wrote a profusion of songs (words and music) and many lyrics for other songwriters. Song is related to the mass exodus of Jews from the Russian Empire during the pogroms and persecution. 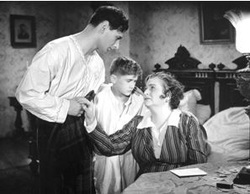 A brivele der mamen (A Little Letter to Mama) is one of the longest-running and schmaltziest tissue-soaking tearjerkers in the aggregate repertoire of sentimental American Yiddish popular song. Solomon Shmulevitsh wrote and first published this song in 1907, at a time when its lyrics resonated with considerable boom in the hearts of many immigrants who had left parents behind in Europe. They knew that they would probably never see them again and that letters would be their only form of communication. Vi ken mayn kind nokh hobn mut? Az mayne shmertsn zenen zeyer tif. How can he still have courage? How has life treated him?